292 Marlborough is located on the south side of Marlborough, between Fairfield and Gloucester, with 290 Marlborough to the east and 294 Marlborough to the west. 292 Marlborough was designed by Ware and Van Brunt, architects, and built in 1872 for builder and contractor George Martin Gibson, for speculative sale, one of five contiguous houses (284-286-288-290-292 Marlborough) designed as a symmetrical composition: 284 and 292 Marlborough are mirror images of each other, each with a turreted bay; they flank 286-288-290 Marlborough, which have stepped (curvilinear) Dutch-style gables. At about the same time, Ware and Van Brunt also designed three additional houses for George Gibson, 282 Marlborough and 7-9 Fairfield. George Gibson and his wife, Frances Rebecca (Esten) Gibson, lived in the Longwood district of Brookline and then in Medford. Click here for an index to the deeds for 292 Marlborough. George Gibson is shown as the owner on the original building permit application for 284-292 Marlborough, dated April 16, 1872, and on the final inspection report, dated October 17, 1872. On October 1, 1872, 292 Marlborough was purchased from George Gibson by architect Henry Van Brunt, who designed it and the other seven houses built by George Gibson. He and his wife, Alice Sterritt (Osborn) Van Brunt, made it their home. They previously had lived at the Hotel Hamilton at 260 Clarendon. Alice Van Brunt’s brother, James W. Osborn, Jr., lived with them. The Van Brunts and James Osborn, Jr., continued to live at 292 Marlborough until about 1876, when the Van Brunts moved to Cambridge and James Osborn moved to 62 Pinckney. Henry Van Brunt continued to own 292 Marlborough and lease it to others. By the 1876-1877 winter season, it was the home of insurance executive George Lewis DeBlois, Jr. and his wife Amanda Malvina (Fuller) DeBlois. They previously had lived at 8 Otis Place. They continued to live at 29 Marlborough during the 1882-1883 winter season, but moved soon thereafter to 253 Beacon. On March 29, 1883, 292 Marlborough was purchased from Henry Van Brunt by Ruth (Appleton) Tuckerman, the wife of Charles Sanders Tuckerman. They previously had lived in the Longwood district of Brookline. Charles Tuckerman was treasurer of the Atlantic & Pacific Railroad until December of 1885, when he became an investment banker. In early 1887, the Tuckermans moved to Chicago, where he became treasurer of the Chicago, Santa Fe & California Railroad. They remained there until completion of the road in May of 1888. During the 1886-1887 winter season, 292 Marlborough was the home of Elizabeth Boardman Ingersoll (Bowditch) Dixwell, the widow of John James Dixwell, and their son, Arthur, a noted baseball aficionado who established the “Dixwell Trophy.” Their primary residence was in Jamaica Plain. During the 1887-1888 season, 292 Marlborough was the home of William Sohier Bryant and his wife, Martha Lyman (Cox) Bryant. He was a student at Harvard Medical School (from which he graduated that year). They had married in September of 1887 and 292 Marlborough probably was their first home together. By the 1888-1889 season, they had moved to 191 Beacon. 292 Marlborough was not listed in the 1889 Blue Book. The Tuckermans returned to Boston in the late 1880s. In 1890, he was one of the founders of the Old Colony Trust Company and subsequently served as its treasurer. By the 1889-1890 winter season, the Tuckermans were living at 292 Marlborough again, They continued to live there during the 1890-1891 season, but thereafter made their home in Salem. Ruth Tuckerman continued own 292 Marlborough and lease it to others. By the 1891-1892 winter season, 292 Marlborough was the home of John Eliot Sanford and his wife, Emily Jane (White) Sanford. In 1890, they had lived at 441 Beacon. Their primary residence was in Taunton. They continued to live at 292 Marlborough during the 1894-1895 season, but moved thereafter to 387 Marlborough. During the 1895-1896 winter season, 292 Marlborough was the home of banker William Pratt Lyman and his wife, Helen (Beeckman) Lyman. They had lived at 233 Marlborough during the 1893-1894 season. They also maintained a home in Nahant. By the next season, they had moved to the Hotel Berkeley (southeast corner of Berkeley and Boylston). By the 1898-1899 season, they were living at 254 Marlborough. 292 Marlborough was not listed in the 1897 Blue Book. During the 1897-1898 winter season, it was the home of Abbie Mardelle (called Delle) (Babcock) Banister (Bannister), the widow of John (Jonathan) Fitch Banister (Bannister). She operated an employment office at 252 Boylston. 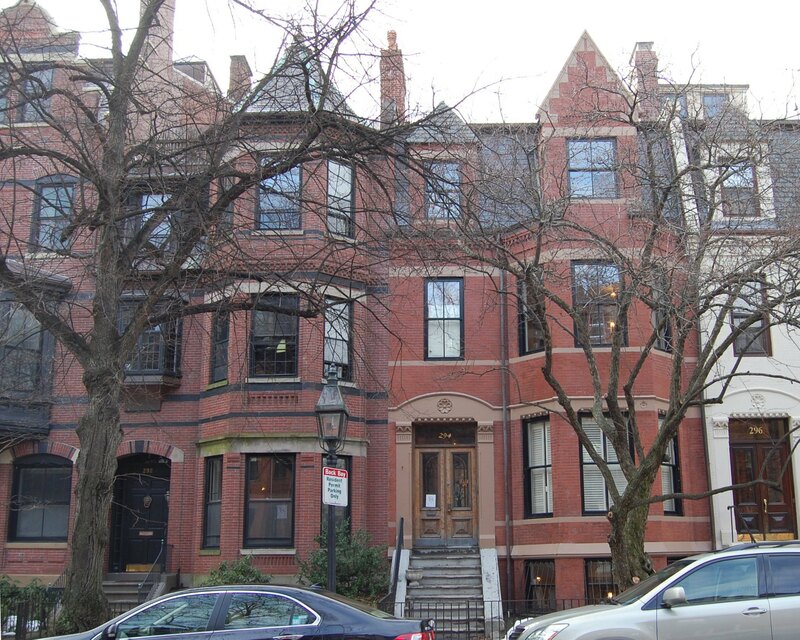 She previously had lived at 5 Oxford Terrace; by 1899, she had moved to 1128 Boylston. During the 1898-1899 winter season, 292 Marlborough was once again the home of Charles and Ruth Tuckerman. 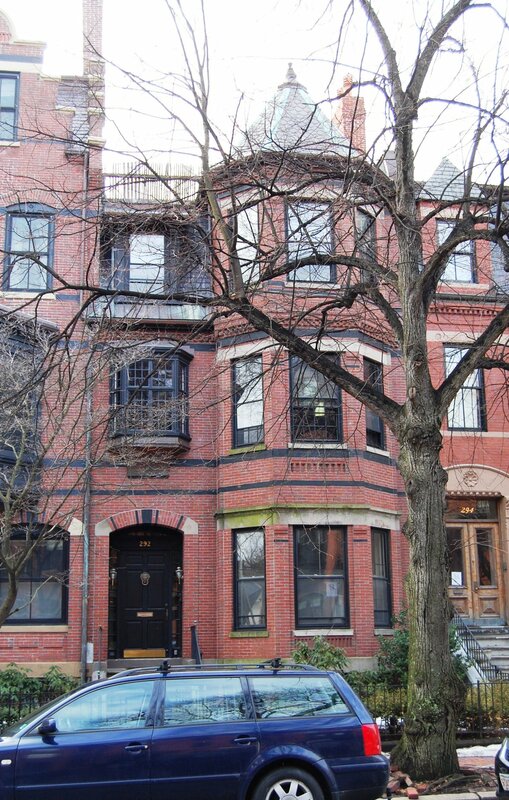 By the 1899-1900 winter season, 292 Marlborough was the home of Catherine (Fallon) Dolan, the widow of Charles Dolan, and their unmarried daughters: Catherine, Julia, and Henrietta Dolan. They previously had lived at 36 Newbury. Mrs. Dolan accepted lodgers and rented space for medical offices. By mid-1904, she had moved to 317 Marlborough. In 1903 and 1904, Dr. Fred Towsley Murphy was a lodger at 292 Marlborough, where he also maintained his office. He previously had been a lodger (and maintained his office) at 142 Marlborough. He married in August of 1904 to Cornelia Brownell Gould. After their marriage, they lived at 309 Marlborough. On June 6, 1904, 292 Marlborough was purchased from Ruth Tuckerman by Dr. Grace Wolcott. She previously had lived at 68 Marlborough. Dr Wolcott was a physician. She and Dr. Lena V. Ingraham were the first medical staff members of the Vincent Memorial Hospital when it was formed in 1891 to provide medical services to wage-earning women. Miss Laura Fisher lived with Dr. Wolcott. She previously had lived with Dr. Wolcott at 68 Marlborough. She was a teacher and the first director of Boston’s kindergartens. She continued to live at 292 Marlborough during the 1910-1911 winter season, but moved thereafter. By the 1912-1913 winter season, Dr. Wolcott had been joined at 292 Marlborough by Miss Ethel Paine. Dr. Wolcott continued to live at 292 Marlborough until her death in November of 1915. 292 Marlborough was not listed in the 1916 Blue Book. On December 21, 1915, 292 Marlborough was purchased from Grace Wolcott’s estate by Samuel Carr, Jr. He and his wife, Susan Waters (Tarbox) Carr, lived at 403 Commonwealth. He was a former banker and secretary to Frederick Lothrop Ames, and was a trustee of the Ames Estate. In April of 1916, Samuel Carr applied for (and subsequently received) permission to remodel the interior of 292 Marlborough. 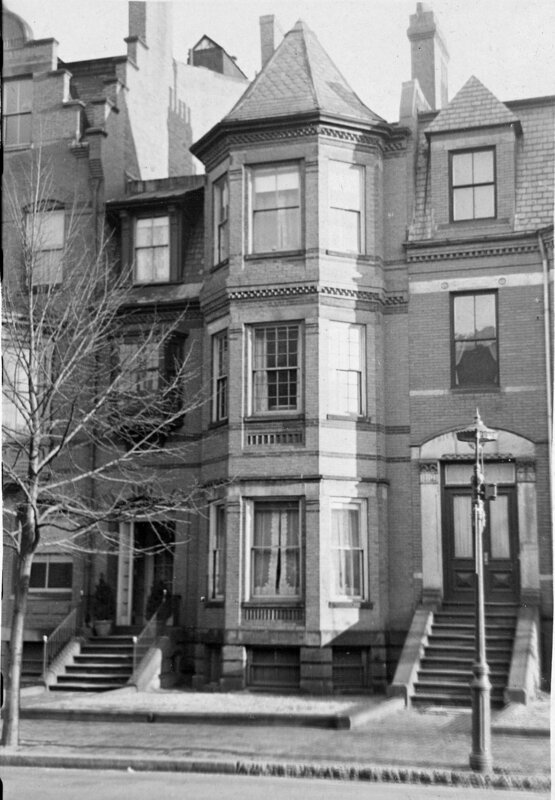 By the 1916-1917 winter season, 292 Marlborough was the home of the Samuel Carr’s son-in-law and daughter, Robert Edward Brewer and Elsie Trowbridge (Carr) Brewer. They previously had lived in Brookline. They also maintained a home, Brooks House, in Beverly Farms. Robert Edward Brewer was an engineer and inventor. Samuel Carr died in May of 1922 and Elsie Brewer inherited 292 Marlborough. The Brewers continued to live at 292 Marlborough until about 1943. On March 2, 1949, 292 Marlborough was acquired from Elsie Brewer by Hans Rudolf Rudolph) Giger and his wife, Helen-Mae (Kidd) Giger, who operated it as a lodging house. They previously had lived in an apartment at 250 Commonwealth and before that at 341 Marlborough. H. Rudolf Giger was a dealer in artists’ materials and supplies. On May 6, 1949, they transferred 292 Marlborough into Helen-Mae Giger’s name. They continued to live there in 1949, but moved thereafter to Winchester. On July 14, 1949, 292 Marlborough was purchased from Helen-Mae Giger by attorney Joseph F. O’Connell, Jr., and his wife, Mary Suzanne (called Suzanne) (O’Brien) O’Connell, who occupied it as a single-family dwelling. They previously had lived at 37 Beacon. Joseph O’Connell died in August of 1966. Suzanne O’Connell continued to live at 292 Marlborough until the late 1960s. On July 1, 1970, 292 Marlborough was purchased from Suzanne O’Connell by Belar Realty, Inc. It became the home of Belar Realty’s president, Richard Nemrow, and his wife, Carolyn Ford (Placak) Nemrow. 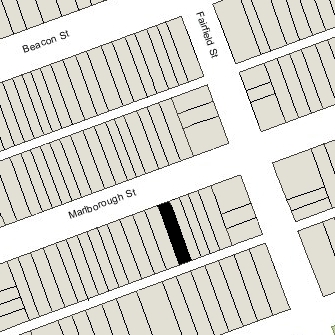 They previously had lived in an apartment at 276 Marlborough. On December 27, 1972, Belar Realty transferred 292 Marlborough into Richard Nemrow’s name. On May 25, 2004, 292 Marlborough was purchased from Richard Nemrow by Marl-Arden LLC (William R. Hettinger and Corinna Hettinger, managers of record).